Vision has split into two separate divisions, one of which is called VAPROS. So when we say VISION / VAPROS, you can rest assured you are getting same high quality as before. With that out of the way, where to begin? The Vision Spinner 2 Mini electronic cigarette is a part of the next generation of Spinner 2 hardware. The Spinner 2 Mini delivers all the power and features of the Spinner 2 in a much more compact form. This incredibly beautiful variable voltage battery comes with an equally awesome looking dual coil X.Fir BDC glassomizer to make for an extremely attractive electronic cigarette with truly exceptional vapor performance. 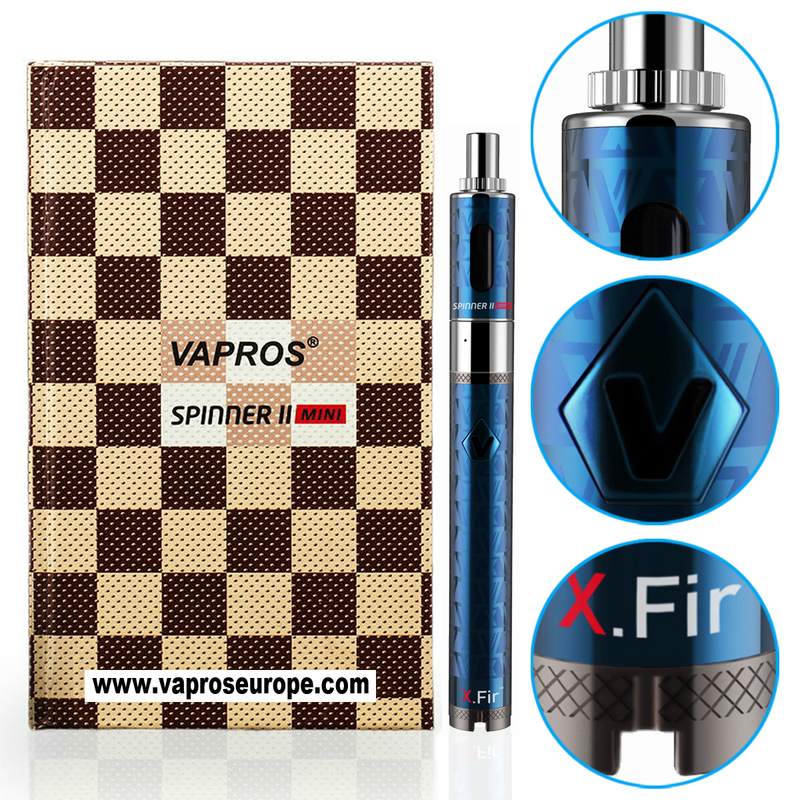 If you need power and style to go along with huge vapour, you would do well to consider the Spinner 2 Mini kit. The X.Fir clearomizer must be mentioned again for its phenomenal vapour production - it's so good it's actually on par with other BDC tanks like Aerotanks and eMows. Flavour transmission is crystal clear and it gives off massive plumes; the throat hit is absolutely superb! Speaking of throat hits, the fact that the Spinner 2 Mini kit is variable voltage kit, you can adjust the strength of the throat hit through voltage.This is a brilliant feature because if you prefer vaping with short puffs, you can increase the voltage and get loads of vapour even though you pull on it for a short time (this is not so with classic batteries). Likewise, if you prefer vaping with longer puffs you can reduce voltage levels and get the exact amount of vapour you want without getting an overload of vapour. Variable voltage not only allows you to adjust the amount of vapour, but also the strength of the throat hit. As you increase the voltage level, the throat hit becomes stronger so you have absolute freedom in choosing how hard a throat hit you want. You'll experiment and find the best voltage level that fits your needs but one thing is certain - no more frustration due to inadequate vapour volume or strength. 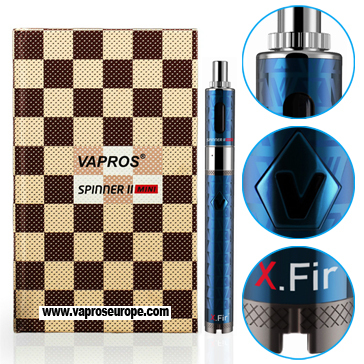 Another exceptional aspect of the Vision Spinner 2 Mini electronic cigarette is the fact that you can leave the dial between two voltage levels and get incremental effects. For instance, if you turn the dial and leave it halfway between 3.3 volts and 3.8 volts, you get an effective voltage of 3.55 volts. Setting the voltage level is very easy as well; you just rotate the dial on the bottom of the battery and align the red indicator with your preferred voltage; nothing more needs to be done. The Spinner 2 Mini kit is also equipped with an upgraded and very stable printed circuit board (PCB) that means the battery is always protected against overcharging, discharging, and short circuiting. The 2ml clear tank not only takes a lot of liquid but also lets you keep a visual check on remaining liquid levels so we can rightfully say that overall, the Spinner 2 Mini kit is one of the best electronic cigarettes in its class and price range! Please note the kit originally comes with an American adapter but we replace it with an EU compatible adapter before sending your order. BDC (Bottom Dual Coil) technology allows for huge clouds of vapor with an incredibly accurate taste. 850mAh with 3.3V - 4.8V variable voltage levels; ability to adjust for different vapour amounts and throat hit strengths. Upgraded PCB (Printed Circuit Board) control head offers extensive protection. Sourced directly from VISION factory. Guaranteed attention-getter; great conversation starter.